Perhaps the reason locals are so fit is because Copenhagen is considered the biking capital of the world. The best way to get around this fairly compact city is on bike or foot. Thanks to its flat structure and infrastructure, life in Copenhagen is lived in the saddle of a bicycle. In fact, the city has hosted the world-famous Giro d’Italia and is now trying to get the Tour de France to start from Copenhagen. Unsurprisingly, the city even has visions of becoming the world’s first carbon-neutral metropolis by 2025. Here, people bike whether there is sun, rain or snow. We spot toddlers out on their first rides as well as ageing grandmas peddling around confidently. You might even catch the reigning monarchy cycle past on their customised cycles across town if you are lucky! Something for everyone Copenhagen Harbour too has, in recent years, been home to a number of significant sporting events like HavneTri (2014), European Triathlon Championships 2007, Red Bull Cliff Diving from the Opera House, and Swoop Challenge CPH Invitational 2015. Although Copenhagen Harbour primarily functioned as a commercial port, today it offers facilities for recreational purposes as well. The fact that the Danish capital is surrounded by water underlines its appeal as a venue for major water sports events. Conditions for both, the audience and the athletes, are unsurpassed. Denmark is also home to Cold Hawaii, one of the most popular surfing spots in the northern part of the world. It will host the world cup in stand-up paddleboarding (SUP), one of the fastest-growing water sports in the world, in September. Compared to other categories of surfing, SUP includes cruising and racing on flat water, which is why the activity is accessible to a wide variety of people in many different locations. From full-on action on the biggest waves to downwind elite racing, SUP is for everyone. If adventure sports is not your thing, you will find enough takers to play a game of badminton or handball with you. One of the big badminton heroes, Peter Gade, calls Copenhagen his hometown. European champions Christinna Pedersen and Kamilla Rytter Juhl are currently making waves on the international scene. The Copenhagen Masters, an invitational event, hosts the best players from around the world. Like most European capitals, the heart of the city is the town square and the Strøget — the famous pedestrianised shopping street (one of the oldest in Europe) lined with boutiques, designer stores and cafes is a good place to start your first day exploring. 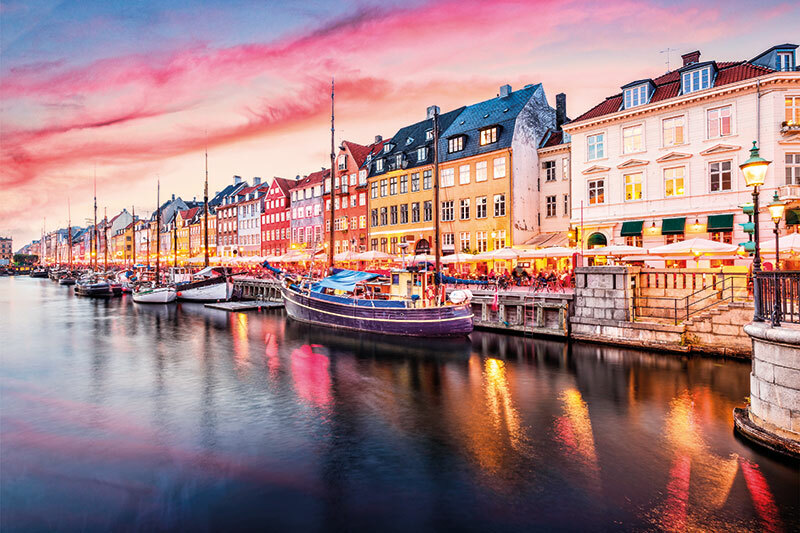 Life takes on a leisurely pace unlike the bigger European cities as most locals can be spotted sipping coffee and eating the famous open sandwiches smørrebrød with unheard-of combos like pigeon with mushrooms and tongue and fried egg or the more familiar smoked salmon. The muscle-aching walk (if you do it in one go) is rewarded with the views of the Nyhavn harbour and it’s a visual treat to see fishing boats, barges and ships cheek by jowl in the water against a backdrop of colourful houses along the waterfront. Copenhagen’s rise as a culinary leader with 18 Michelin stars to 15 restaurants is no mean achievement. The rise of New Nordic cuisine with its emphasis on seasonal ingredients, sometimes raw and pickled, has taken the world by storm! In Copenhagen, cuisine is elevated to a veritable art form and at restaurants like Noma (repeatedly voted as the best in the world) you might be treated to a meal of deep-fried moss, edible flowers and, if you are very lucky, even live ants! The epic rise of Noma led to a revolution in kitchens across the world which were in turn inspired by the revival of this traditional Nordic style of food preparation and curation. Light, clean dishes prepared with local and regional ingredients include surprises like raw meat and sauces from partially digested bird food which are predominant on a changing menu. While Noma has moved on, its star chef René Redzepi’s latest venture 108, is worth a visit. Don’t miss out on the raw Norwegian scallops, salt-baked celeriac and cured squid with bacon broth. It’s hard to just walk into one of these fine dining temples without months of being dangled on a waiting list. The better, cheaper and more sensible option is to savour the local food in a mix of upscale and moderately priced restaurants that offer equally delicious fare without the fuss. One of my personal favourites is Manfreds in the hip street of Jaegersborggade (don’t even think of pronouncing it) in Nørrebro. Here we relish home-style food prepared using raw materials of the highest quality, in an unpretentious atmosphere. Sampling beef tartare that melts in one’s mouth and delicious home-made wine make for an unforgettable treat. Denmark’s royal lineage is a must-see and I keep getting pulled back to the city because of its two iconic palaces. At Amalienborg Palace (one of the greatest examples of rococo architecture), where the royals reside, you can watch the daily changing of the guard at noon, under the bronze gaze of Frederik V’s statue. For a visual treat I always head to the lavish Rosenborg Castle, built by Christian IV — an art lover and Epicurean — as a summer retreat. Fairly modern and built in the 17th century one can gaze at the eye-popping jewels and the throne room of the royal family for hours. Don’t miss out on the stunningly intricate crown jewels and narwhal-tusk throne surrounded by golden lions. Whether travelling with children or not, try to spend a couple of evenings at the Tivoli Gardens. And not just because it is the second-oldest amusement park in the world but as it’s an oasis in the city, cleverly built by Christian VIII to distract his subjects from political upheaval. The whole look of the place is old-fashioned and quaint instead of glitzy and over the top. At night when it is illuminated by thousands of fairy lights, it gets magically transformed to something akin to a set from a Hans Christian Andersen story. And of course since its Copenhagen, even the amusement park has two Michelin-starred restaurants! Bon appétit!